I'm off on my next adventure and it has already been such a remarkable one friends. Hawaii is stealing my heart. I can travel all over; from mountains, to the city, to my sweet little country town in North Carolina. But at the end of the day, my heart will always and forever be a beach bum. Always. So even two days into this trip, Hawaii is by far, my absolute favorite place my little scratched up feet has wandered upon. I am so excited to share my stories and adventures for this next week. We started our morning getting up really early and heading downtown (which is the absolutely cutest by the way). We ate breakfast on the water and chose acai bowls to eat. If you haven't had one yet, I reccomend it a million times over and over again. I'm slowly and surely getting hooked on them. Acai bowls are basically really thick smoothies topped with oats and fruit and all sorts of wonderful different things. Please try one of you haven't already. It was such a good meal to start the day and so healthy too. We then spent the rest of the day on Ericka's favorite beach spot called Kua Bay. It's a beach also surrounded by volcanic rock so you kinda get the best of both worlds. I actually cried when we drove up and I saw how clear the water was. This was a moment that a lifelong dream was finally brought to life. I still won't ever to be able to get over how crystal clear and blue the water was. 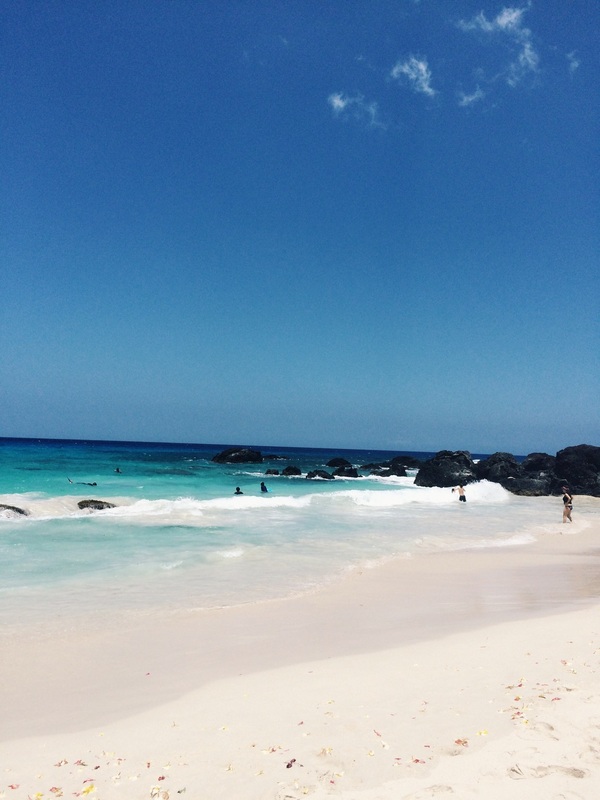 Hawaiian beaches forever. There were also an insane amount of flower petals floating all around which was really fun too. Most of them were in the water so it was like swimming in a fancy big bathtub with wild Hawaiian flowers. What a dream. My favorite part of the beach adventures were the sweet YWAMers I got to connect with. YWAM (Youth With A Mission) is an insanely amazing program where students and adults from all over the world go to different bases to pretty much follow Jesus in an incredible real and tangible way through different programs. I'm not the best at explaining it, but if you go to their website it will definitely explain it better than I ever could. I actually ended up meeting two ladies who are in a program at the YWAM base in Kona who knew me immediately from Instagram. WHAT. Miles and miles away from home and I meet two people who follow my little journey because of Instagram?!?!?! It was so sweet and dear to my heart, such a cool story I can tell others about. We ended up swimming with fish and a real life sea turtle (even though I scared them all off because I was screaming with excitement). Yes. I repeat a real life sea turtle. It was absolutely incredible. Kua Bay was spot on. Next time I will just remember to wear sunscreen. Whoops.